Owing to our state-of-the-art manufacturing unit, we are affianced in manufacturing, exporting, importing and service providing of highly efficient assortment of Sheet Extrusion Plant, Thermoforming Machine and PP Non Woven Spun bond Line Machine. The offered range is designed and manufactured using high quality components and progressive technology in compliance with international quality norms. The offered products are appreciated among clients for their sturdy design, optimum functionality, high efficiency, longer service life and hassle free functioning. Our product range includes a wide range of pptq blown film plant, pp blown film plant, pp blown film machine, three layers blown film machine and five layers blown film plant. 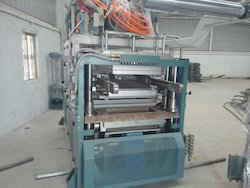 EPS Thermoforming machine is 7 Axis Servo driven machine. Its major motions like forming mould up and down, cutting, chain transport and sheet feeding axis are servo motor driven. Capacity of EPS Thermoforming varies with the sheet thickness and density of the foam sheet. Assuming that machine forming station is running at 30 strokes and article weight 4 grams and 12 cavity mould would give the output of approx 86 kg/hr. To manufacture EPS Foam Disposables containers like plate, tray, bowl, multi-compartment plate and hinged containers etc. from EPS foam Sheet. 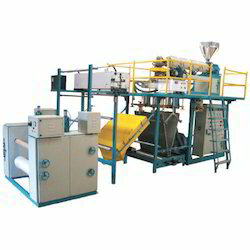 EPS Foam Sheet Extruder line is equipped with tandem extruder and runs on AC drive based programme. Heating zones are controlled by PID temperature modules. To reduced the density of the PS material, LPG gas is injected in secondary extruder as the foaming agent. Circular die and cooling mandrel are the key component of the machine. Capacity of Sheet line varies with the sheet thickness, width and type of raw material used and density of the foam sheet. Assuming that machine would run with 50% fresh GPPS material and 50% regrind granules and extruded sheet is with thickness and 1100mm width would give the optimum output of 250 kg/hr. To manufacture EPS foam sheet, which is in turn used to produce containers like round bowl, square dona, tray, multi-compartment plate and hinged containers etc. EPS Extruder Coating line runs on AC drive based programme. Heating zones are controlled by PID temperature controller. Coating die is of coat hanger type and its mounted overhang downward. 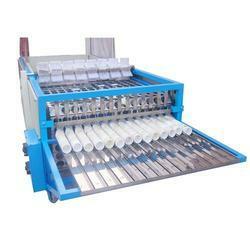 Lamination/coating unit is an important assembly on which quality of the coating depends. Capacity of Extruder coating line depends on the line speed of the lamination/coating assembly and the screw RPM of extruder. 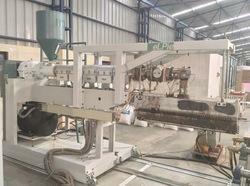 Extruder maximum output is 200 kg/hr and maximum achievable line speed is 60 meter/min. To convert EPS Foam sheet into EPS foam coated sheet (coating material is combination of HIPS/GPPS) which is in turn used to produce containers like round bowl, square dona, tray, multi-compartment plate and hinged containers etc. 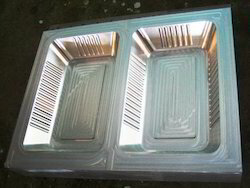 We are a leading Manufacturer of eps square tray mould, eps cup moulds, eps round plate mould and tray mould from Rajkot, India. 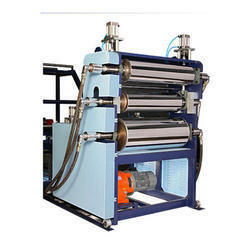 PP/PS/PET Thermoforming machine is hydraulic power pack based machine. Its major motions like 1) forming mould up and down is driven by Hydraulic cylinder-powered by hydraulic pump 2) chain index is driven by AC motor controlled by digital encoder 3) Plug up-down motion is with help of pneumatic cylinder. To manufacture PP/PS/PET Disposables containers like plate, tray, bowl, multi-compartment plate, tea cup, juice glass, meal tray, lunch box, panet and hinged containers etc. from PP/PS/PET Sheet. 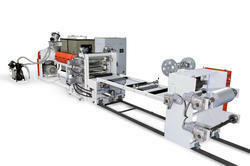 PP/PS Sheet extruder line runs on drive based programme. Heating zones are controlled by PID temperature modules. Coat hanger type die and hardcrome super mirror finish cooling rolls are the key features of the line. 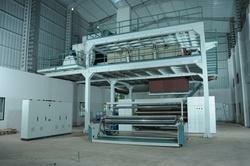 Capacity of Sheet line varies with the sheet thickness, width and type of raw material used. Assuming that machine would run with 50% fresh PP material and 50% regrind chips and extruded sheet is with maximum thickness and maximum width would give the maximum output of 250 kg/hr. To manufacture PP/PS Disposables containers like cup, tray, lid, multi-compartment plate and hinged containers etc. from PP/PS Sheet. Providing you the best range of extruder calender roller with effective & timely delivery. 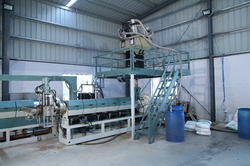 Leading Manufacturer of automatic cup stacker machine from Rajkot. 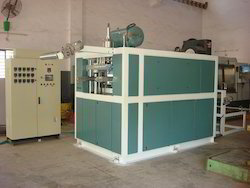 PP Non-woven single beam spun bond line is PLC based 9 no AC VFD driven based machine. It is tower like knock down type structure made of heavy duty I and C and H sections. Its Process control panel is air conditioned and total control is through single touch screen mounted near winder. Capacity of PP Non-woven single beam spundbond line varies with the fabric thickness and GSM. Assuming that machine is running at maximum line speed with maximum fabric width and GSM would give the output of approx 450 kg/hr. To manufacture PP non woven fabric with different GSM, width and colour in roll form. Offering you a complete choice of products which include automatic vacuum forming machine and vacuum forming machine. 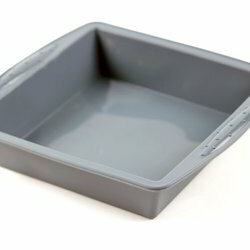 Prominent & Leading Manufacturer from Rajkot, we offer thermoforming mould. Offering you a complete choice of products which include plastic tea cup making machine, plastic cup making machine and plastic plate making machine. Our product range includes a wide range of extrude coating and lamination machine.